We are very pleased to offer two high quality, nice sounding electronics packages for your hurdy gurdy. ​With either package, the 'gurdy is actually an 'electro-acoustic' instrument, so you can play either 'plugged' or 'unplugged'. ​The electronics do not alter the instruments acoustic voice. Consists of two high impedence elements inside the instrument, which combine into a standard 1/4" guitar jack. Volume & tone are controlled externally, either by an outboard preamp or an amplifier. Outputs to a standard guitar cable. Consists of three pickup elements inside the instrument, one for each bridge, each with it's own volume control. There is a 4th knob which is the master instrument output. All this outputs into a standard 1/4" guitar jack. 9-volt battery housing / underside of instrument. Battery life is 12,000 hours. Volume 1: This controls the volume for the trompette bridge. 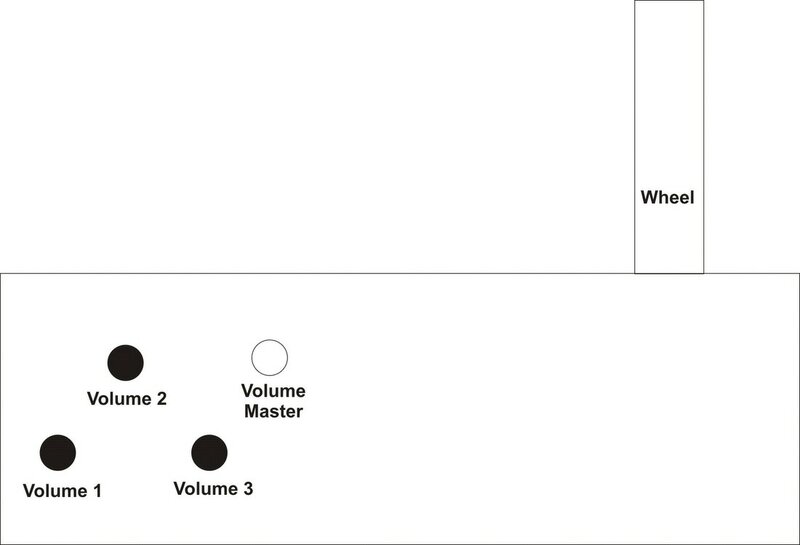 Master Volume: The first 3 volumes (above) are more like an onboard mixer. Once you have your balance set up how you like it, you can use the master to control the overall volume to your amplifier.